The challenges of the last few years have brought big changes to the hedge fund industry, and with those have come changes in the way service providers handle the increasingly complicated demands from hedge funds and also the increasing demands on hedge funds. This has been especially true for the compliance sector, which has grown steadily as regulators have turned their gaze more and more on hedge funds. IMS Group were one of the early movers in the compliance world. They were founded in 1997 by Scott Wilson, and the firm grew organically from then, becoming one of the leading compliance firms in a relatively new field – previously the work had mostly been done in-house or as part of a broader legal offering. IMS saw that this was not necessarily working for companies big or small. The smaller firms did not have the expertise, and larger firms wanted to know that they were following industry standard practice. “Managers want the independence that we can bring, the understanding of what other firms do,” says Stephen Burke, managing director of IMS. IMS Group’s core offering of compliance consultancy extends throughout a fund’s lifetime. They can help funds from before authorisation, and can even offer the capability to market a fund while it awaits approval, using their hosted regulatory platform, Mirabella, which they fully acquired last June. Mirabella allows a manager to start operations with all of the relevant FSA (soon to be FCA) and SEC permissions, while they wait for authorisation proper. This backing allowed for the game-changing merger with HedgeOp, a New York compliance firm founded by Bill Mulligan. This was completed just over a year ago, in January 2012. Under the new leadership of Michel van Leeuwen, CEO after Wilson moved on, the firm has been running as a single entity operationally for a while now; the next hurdle is the full merger from an outside perspective. Both parties saw it as a natural match between two firms whose offerings were broadly similar. “What we found in HedgeOp,” says Burke, “was a firm which was, as people said at the time, scarily like us in terms of the way they think, the way they operate, the overall culture. This similarity made the structuring of the company very easy; the New York and London offices are roughly the same size, and there is a lot of what Burke calls “knowledge share” between the offices, although they have some slightly different emphases. This is the nature of compliance; it needs to be fine-tuned to different jurisdictions. In the US, for instance, personal account trading (often for a personal pension fund) needs to be monitored more rigorously than in the UK. The merger with HedgeOp has made IMS capable of handling these detailed differences. An important part of the improved offering to clients is the ability to seamlessly move to a new regulatory regime if a client wishes to expand, without the need to go elsewhere. IMS have ensured that this need will not catch them out. They can deliver expert advice if, as often happens, a new opportunity requires compliance with a completely different regime. The joining of the two firms matches the broader movement towards a truly global hedge fund industry. Geographical boundaries are being heeded less and less, as funds look to find alpha across the world. The requirement to comply with foreign regimes will only increase in the future; indeed, it is relatively uncommon for a fund to stay in one country. The ability to offer expertise across different jurisdictions marks out IMS’s service. IMS also put great weight on being a client-driven organisation who can respond to new needs from clients. One of the requests they were repeatedly hearing was the ability to comply in Hong Kong. IMS listened to this, and have now, since early March, opened a Hong Kong office, headed by Jonathan Currie, which will offer the capability to comply with the SFC’s requirements there. These developments and expansions are all very important to the IMS offering, but they stress that this does not distract them from their core service. Their global structure offers them a broad range of expertise, and the ability to deliver for the very largest clients, but start-ups are always an integral part of their business. Burke describes their business as one which caters to “boutiques of all sizes”. This might sound paradoxical, but it is emblematic of the way in which IMS seek to set themselves apart: they have global capability, but can offer the same level of service to the start-up. Compliance is not something that will ever go away, which is why IMS put great emphasis on the future, in terms of their own business, their clients’ businesses, and the industry as a whole. but the main method is working to give clients the training they need to understand the compliance environment. In the next year the AIFMD will be the big driver of regulatory change. 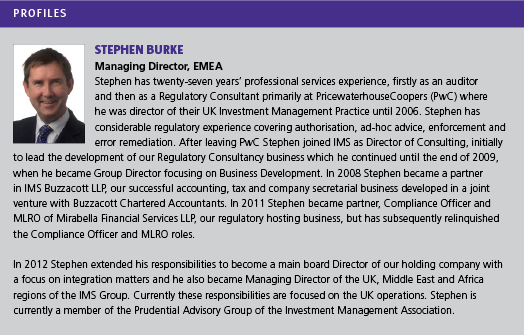 Burke says that “The AIFMD is going to tick up the obligations quite significantly on European managers which will have an impact on global expectations in due course.” However, he also believes that UK managers should also be cautious about the FCA’s new mandate. “The main difference is the FCA is a themes-focused regulator, which is going to have, over time, a relatively significant impact on the way in which the industry is regulated,” says Burke. It is this proactive, responsive approach to compliance which IMS Group places at the centre of its service. IMS have positioned themselves in the centre of the global compliance community, and are always looking for new ways in which they can help clients to fulfil their regulatory obligations.